Since 1946, SABO FOAM concentrates have provided fire protection for life and property around the globe. Our new, state-of-the-art manufacturing and testing facility in Cologno Al Serio (Bergamo), Italy, builds on this 70-year legacy of high-performance fire suppression. 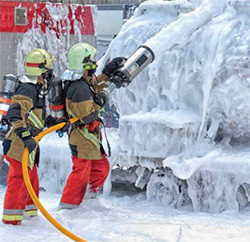 Advanced research, experienced technical service, unmatched customer support, 24-hour global logistics and exacting test services, in combination with manufacturing excellence, make SABO FOAM concentrates the industry choice for firefighting foams. The extensive range of concentrate products are designed to meet the most challenging fire hazards in civil, municipal, marine, industrial and military applications. Dedicated customer support. Extensive product portfolio. Engineering excellence. Trusted, proven brands. Johnson Controls offers all of these attributes, plus a passion for protection. It’s what drives us to create solutions to help safeguard what matters most – your valued people, property and business.